Israel Nery is a first generation Salvadorian-Mexican, born in Compton, and raised in Los Angeles, CA. Israel completed his undergraduate studies at the California State University, Monterey Bay, where he earned a B.S. in business administration, and graduated with honors in 2009. Israel earned his M.B.A. from Woodbury University in 2011. He then earned his Juris Doctorate from the University of Illinois College of Law in 2014. While attending California State University, Israel was a college athlete playing for the men’s soccer team. During his tenure, he was awarded the All-Academic Award by the California College Athletic Association (CCAA). While attending graduate school at Woodbury University, Israel worked for RockCorps, a pro-social production company that uses music to inspire people to volunteer and get involved in their community. As a law student, he interned and volunteered for numerous private and public organizations such as the United States Bankruptcy Court for the Central District of California, Neighborhood Legal Services, AFL-CIO, the Office of Legislative Affairs for Illinois Governor Pat Quinn, and the Student Opportunities for After-School Resources (SOAR) program. 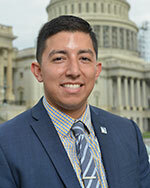 Israel was heavily involved in the student body at the University of Illinois College of Law by serving as president of the Latina/o Law Student Association, being elected as a representative for the Student Bar Association, and selected as a student liaison for the ABA Section of Labor & Employment Law Standing Committees. For his efforts, Israel was awarded by the Illinois College of Law the Rickert Award for Excellence in Public Service, the most prestigious award by the College of Law to students who have demonstrated an outstanding degree of commitment to work in the public interest. As a CHCI Law Graduate Fellow, Israel seeks to build on his skills and experiences to gain a better understanding of the public-policy making process. He hopes to gain valuable insight into the areas of civil rights, taxation, and finance laws and analyze how each of them affects the Latina/o community directly.